Ever wondered why some properties realise a sale price higher than others that seemingly appear to be comparable? Whether it is completing some low cost home improvements, understanding the legal process or being aware of the local market, arming yourself with knowledge is crucial. What is the authority to sell? • the authority period or amount of time given to the agency to sell the property. • a statement explaining that you can lodge a complaint with Consumer Affairs Victoria should a dispute over commission or outgoings arise. What different types of authorities are there? The most common type of sales authority is the exclusive authority which means you appoint a single agency to exclusively market your property. Under an exclusive authority the agent is entitled to commission when the property is sold or when the agent receives a binding offer at the vendor’s reserve or asking price. You should not sign more than one exclusive authority, as in certain circumstances you may have to pay more than one commission. Although it is less common, you can use a general authority. This allows you to list with more than one agency but only pay commission to the agency that sells your property. Can I cancel the authority I gave to my agent to sell my property? Not during the exclusive authority period unless your agent agrees, if you have signed an exclusive auction or private sale authority. If the exclusive authority also has a non-exclusive period you can cancel that at any time, by giving your agent written notice. If you engage the services of another agent on an exclusive basis while you have a current exclusive authority, you may have to pay each a commission on the sale of your property. If you gave your agent a general sale authority, you can cancel it at any time by giving your agent written notice. I have just signed an authority for an agent to sell my property. Do I have cooling off rights? No. The authority you have signed does not provide you with the right to cool off. If you list a property for sale with an agent, you are engaging that agent to help sell your property. The agent must act in your best interests, including following your lawful instructions and engaging in good estate agency practice. The agent will charge you a fee for this service, usually in the form of a commission. The commission is negotiable and can either be a percentage of the sale price, a fixed fee or a combination of both. You can also expect to pay an additional cost for advertising associated with marketing your property. • receive and hold the full deposit. Laws govern the licensing and conduct of agents. These laws prohibit unethical practices such as misrepresentations about property including the price, location, size and dummy bidding at auctions. In a private sale, the property is advertised and offers are invited from prospective buyers. The sale is negotiated between the buyer and seller, usually with the help of an agent. • there is a three business day cooling-off period (with exceptions) for residential properties. An auction is a public sale, usually conducted by an agent acting as auctioneer. The auction is advertised for a specific place, time and date. Prospective buyers bid and, if the property is declared ‘on the market’, it is offered to the highest bidder. • you have no cooling-off rights if you buy at auction. Deciding on a method of sale? The agent will recommend a method of sale for your property based on its type and location, the nature of the market and your available time frame and personal preference. They should also back up their recommendation with recent sales data. You should understand all the advantages and disadvantages before deciding on a method of sale. The agent’s commission is generally the same whether the property is sold privately or at auction. In Victoria, there is no amount set by law regarding the amount of commission a real estate agent can charge you. You are free to negotiate with the real estate agent regarding their sales commission, marketing fees or any other expenses that you may be required to pay. As a guide, real estate commissions in Victoria generally range from 1.5% to 2.5% in metropolitan areas, and between 2.5% to 3% in regional and rural Victoria. What is the estimated selling price? Before you sign an authority to sell, the agent must provide you with an estimate of the selling price of your property. This is the price the agent estimates your property is likely to attract, based on their experience, skill and knowledge of the market. It must be recorded in the authority to sell as either a single amount or a price range. If estimate is recorded as a range, the difference between the top and the bottom figures must not exceed 10 per cent of the bottom figure. For example, a quoted range of $400,000 to $440,000 is $400,000 plus 10 per cent. This price is not a sworn valuation or a guaranteed selling price and it does not have to be the same as the seller’s asking price or auction reserve price. The time it takes to sell your home will depend on a number of factors. The price you are after, the location, buyer demand for your style of property and even events locally and nationally can play a part. An experienced Brad Teal selling agent will understand your local market and be able to assess how the current circumstances will apply to you and selling your home. A good rule of thumb is to look at comparable sales for properties similar to yours and ascertain how long these properties have taken to sell. What is the role of a real estate agent at an open house? When selling your home, the key to success is to get buyers through the door. At an open for inspection, this is an opportunity for your real estate agent to engage potential buyers in conversation to ascertain their true level of interest in your home. The aim of any conversation with a potential buyer is to find out each buyer’s specific circumstances and requirements. The agent will then be able to highlight to each buyer particular aspects about your home that they feel will appeal and be relevant to them. A potential buyer will attend an open house to view a home to decide if it fits their requirements. Whilst an agent needs to be attentive to answer any questions that arise, they also need to be respectful of a buyer’s need to feel at ease in a home and not feel pressured. A good agent is adept at knowing when to engage in conversation with a potential buyer and when to discretely provide them with space. Why should I not be present during an open house? Anyone considering purchasing a home will want to take their time to wander through and start to feel at ease. Once a buyer starts to picture themselves living in a property, they are more likely to seriously consider buying your home. If a buyer feels that they are intruding on a current owner’s space, they may feel uncomfortable and choose to leave early. When a buyer knows they can take their time, they will feel relaxed, unhurried and wander through your property, giving due consideration as to whether it suits their needs. Why is it important to declutter my home when selling? First and foremost, you want any potential buyer to picture themselves living in a property. If your home is scattered with personal items such as family photos, or cluttered with oversized or excess furniture, this can negatively impact a buyer’s first impression. A buyer will want to know that their furniture will fit into the home they buy. Many people cannot visualise a space, so decluttering will open up each room and help your home appear larger and lighter. If you’re unsure about what you need to do, speak to a Brad Teal team member who can guide you on presenting your home for sale in the best possible way. If you have spent more money on your property than you will likely recoup from the selling price, this is referred to as having ‘overcapitalised’. Whilst works undertaken by you, such as landscaping or a renovation to a kitchen or bathroom, will likely add value to the property, there is no guarantee that you will recoup the full amount spent on these improvements from the price you achieve when you sell your home. My property is currently leased - can I still sell my property? Yes, you can. However, you will need to follow specific protocols. You must respect the terms of any lease you have signed with your tenant. Unless both parties agree to terminate early, your tenant has the right to occupy the premises until the end of the lease term. Your tenant is also required to be given 24 hours written notice prior to every open for inspection. Details of a current lease must be outlined in the contract of sale paperwork and potential purchasers must be advised there is a current lease on the property. Having a tenant in place can be appealing to some buyers, particularly investors who are looking to purchase your property as an investment. Buying with a solid lease in place will give them peace of mind. Speak to a Brad Teal team member, as they will be able to advise you on the steps you need to follow and also liaise on your behalf with your tenant or rental manager. The nature of the agreement you signed with your real estate agent will determine whether or not you have to pay your agent a commission if you sell your property yourself. If your agent actively marketed the property and this resulted in exposing your property to the buyer, then you may still need to pay the commission. Other circumstances may also mean you still need to pay the commission, so it is best that you seek the advice of your solicitor or conveyancer or speak to your agent directly. A real estate agent can provide you with an assessment of your property. An assessment by an agent will be based on the real estate agent’s local knowledge and expertise, coupled with comparable past sales and current market trends. Whilst an assessment provided by an agent can be used as a price guide, it has no formal standing. A formal property valuation, also known as a sworn valuation, can only be carried out by a licensed valuer, who will charge you a fee. The valuer will provide you with a detailed property report. This report can then be used to support any formal finance applications made by a buyer or seller. Yes. Some people do choose to bypass using the expertise of a qualified real estate agent and undertake the task of selling their house themselves. But choosing to sell your own home will not suit everyone. Fielding buyer enquiries and negotiating with potential buyers can be both confronting and an inconvenience for many people. Additionally, where a buyer knows you are not paying a real estate agent to broker your sale, they may have an expectation that you will be willing to reduce the price of your home accordingly. This is why an experienced real estate agent is often a wise choice to make, in order to sell your home quickly and for the best price. Your local real estate agent will be active in your area. Therefore they are best placed to advise on how to market your home and offer advice on the price your house will sell for. Brad Teal sales agents are local area experts and bring to the table a wealth of knowledge and expertise in dealing with buyers and are well placed to successfully negotiate the sale of your home. What marketing costs should I budget for? There are many different methods a real estate agent can choose to raise the profile of a home they are selling. Marketing methods can include: advertising on the internet, using social media, property signage, letterbox drops, holding open for inspections, promotional flyers, newspaper advertising and more. A marketing campaign will be agreed between the agent and the property owner. Your Brad Teal real estate agent will tailor your marketing specifically to meet your needs. Any marketing costs are payable by the vendor and constitute a separate expense to any sales commission that is payable to the agent. Marketing costs are payable by the vendor irrespective of whether or not the property is sold. When a buyer makes an offer to purchase a property under terms to which the seller agrees, as soon as the contract becomes legally binding, this is referred to as “going unconditional”. At this point both the buyer and the seller are legally obligated to complete the transaction for the sale of the property on the terms agreed. For example, a buyer may agree to purchase a home subject to obtaining finance to do so. As soon as the buyer has secured formal approval to finance the purchase, the contract will be deemed unconditional and the sale is binding on both parties. The Auction system is a popular strategy that works particularly well with properties in highly desirable areas, where competition between buyers is expected to be high. This very public style of sale has many benefits which include competitive bidding and certainty of a set date for the sale (assuming the reserve is reached). Even if not sold at auction, further negotiation with unsuccessful bidders often results in a sale shortly after the auction. In addition, there is always the option of accepting an offer prior to the auction date. A four week advertising program tailored specifically for your property will ensure the market is aware of your forthcoming auction. Private sales are divided into two strategies. Firstly, advertising and Open For Inspections are arranged (as with an auction campaign), but with a set asking price. Alternatively, a low key private sale campaign can be arranged, whereby we contact buyers in our large buyer database and arrange for more discreet inspections to take place. Each vendor and each house is different, requiring campaigns to be designed with careful thought and a tailored strategy. Our pledge is to get you that price. Through a proven market strategy, based on extensive local knowledge, current property trends, comparable sales data, the combined efforts of our multi office network and a genuine care and concern for our clients, we are confident that the best possible price is achieved. “You don’t get a second chance to make a first impression”. There are many small, inexpensive ways of making your home more appealing to a potential purchaser. Addressing cosmetic improvements, maintenance and minor repairs to your home is worth the effort and often has a positive impact on the eventual sale price. 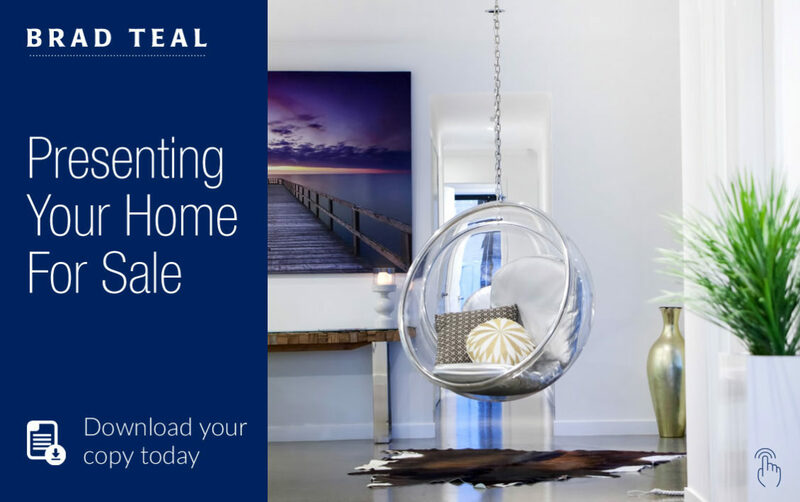 The Brad Teal team believes it is essential for your home to be presented in the best possible light and has created a Presenting Your Home For Sale booklet available from our offices, free of charge. At Brad Teal we believe in providing the highest level of service to our vendors at a realistic rate of commission, which is determined on a property by property basis and is fully negotiable. Commission can be a flat dollar amount, a percentage of the sale price, or performance based with a variable percentage rate. In the unlikely event of a property failing to sell, no commission is payable. There are no up-front charges for selling property with Brad Teal. How much does street appeal really matter when selling your home? At Brad Teal Commercial, we take a holistic approach to managing commercial properties. Firstly, we ensure short-term issues such as collection of rent and outgoings, negotiation of lease terms, tenant liaison and management of building maintenance are all conducted quickly and professionally. Secondly, we manage your investment. We understand that long term investment growth (both in capital growth and rental return), must be managed proactively by considering economic and local market trends, ensuring your property realizes its maximum potential. As a separate division of Brad Teal Real Estate, Brad Teal Commercial is a team of commercial experts whose sole focus is on the sales and leasing of office, retail and industrial property Contact us for a free, no obligation market opinion of the value of your property or total portfolio.